So it goes now. Whoever wants to be clever must agree with nothing that others esteem. He must do something of his own. This is what that fellow does who wishes to turn the whole of astronomy upside down. Aristotle’s Physics…should be altogether discarded, together with all the rest of his books which boast of treating the things of nature…I venture to say that any potter has more knowledge of nature than is written in these books. It grieves me to the heart that this damned, conceited, rascally heathen has with his false words deluded and made fools of so many of the best Christians. God has sent him as a plague upon us for our sins. We are at the dawn of a new era, for we are beginning to recover the knowledge of the external world that we lost through the fall of Adam. We now observe created things properly, and not as formerly under the Papacy. In fact, it is because of the very truth of relativity that De Cusa outlines that the commonsense ‘default’ view was bound to remain the apparent one from the position of a terrestrial observer, i.e. of a geocentric cosmos with a non-rotating earth, until shown otherwise. So, of course, if other more unusual ideas were to get traction then they would indeed turn the whole of astronomy upside down. Contrary to popular opinion, Ptolemaic-style epicycles were still required in Copernicus’ heliocentric system to match observational data since perfect circular motion was assumed: Kepler’s discovery that planets orbited the sun in ellipses, thus obviating the necessity for epicycles, was still some decades off in the future. As noted, there was no compelling observational evidence in favour of heliocentrism in Luther’s day: confirmation that at least some of the planets orbited the sun would have to wait until the telescope (invented in 1608) revealed the phases of Mercury and Venus, and even then there was no observational evidence in favour of a Copernican heliocentric model over the geo-heliocentric model of Tycho Brahe, which had all the planets (other than earth) orbiting the sun, and the sun and the moon in orbit around the earth. I like astronomy and mathematics, which rely upon demonstrations and sure proofs. As for astrology, it is nothing. Astrology is no art; it has no principle, no demonstration, whereupon we may take sure footing; it is all haphazard work…Astronomy, on the contrary, I like. Given the historical context in the 1530s, Luther’s alleged remark about a pretentious astrologer advancing indemonstrable novelties that would require astronomy to be turned on its head is quite innocuous, as well as rather witty and wonderfully prescient. It is extremely bad scholarship to project the knowledge and understanding we enjoy today back onto the knowledge and understanding that men could have had in the past. Thus the treatment that some historians have made of an alleged remark over a dinner table, the sentiments of which are nowhere found in Luther’s writings, is nothing short of disgraceful hubris: Neyman (The Heritage of Copernicus) calls Luther’s remark the “crudest imaginable piece of dogmatism”, and Butterfield (The Origins of Modern Science 1300 – 1800) brands it a “scathing condemnation”. Kearny (Science and Change 1500 – 1700) writes that Luther’s attitude in the matter was similar to a savage looking at a watch. These writers are very hypocritically indulging in the very behaviour they are baselessly accusing Luther of, and demonstrating their biases to boot. As for the idea that the Lutherans and the University of Wittenberg made it difficult for the Copernicans, let us examine the testimony of history. But first, what do the propagandists say about it: the notorious anti-Christian propagandist Andrew Dickson White wrote that “all branches of the Protestant Church …vied with each other in denouncing the Copernican doctrine”. But whatever White says about the Church, the opposite is likely to be a surer guide to the truth. Even the esteemed scholar of Copernicus, Thomas Kuhn, said that “Protestant leaders like Luther, Calvin, and Melanchthon led in…urging repression of Copernicans”. Ultimately, it was none other than Copernicus himself who held off publishing his treatise. He states in the work itself that he had been sitting on it for 36 years. Copernicus had, in fact, written his first work on heliocentrism, an untitled forty-page treatise now known as Commentariolus, as far back as 1514 or earlier, and had distributed it to close friends. Then in 1533, a series of lectures was given in Rome outlining Copernicus’ theory, which were attended by Pope Clement VII and several cardinals, who showed considerable interest in the heliocentric hypothesis. Indeed, in 1536 cardinal Nicholas Schönberg of Capua wrote to Copernicus from Rome requesting a copy of his writings “at the earliest possible moment”. Copernicus himself mentions in De Revolutionibus that cardinal Schönberg, as well as the Roman Catholic bishop of Chelmo, Tiedemann Giese, and many others had encouraged him to publish his heliocentric theory. But it was eventually the Lutherans from the University of Wittenberg who sought him out, convinced him of the capabilities of the printers, did a ‘test marketing’ of his ideas, and undertook to see the whole project through to completion, with Osiander, a Lutheran minister, penning the preface to head off criticism and allow wider acceptance and dissemination. How did this come about? Furthermore, Copernicus was far from academic centers, thereby lacking the stimulation of technically trained colleagues with whom he could discuss his work. Then, in 1539, the situation changed: a young professor from the Lutheran University of Wittenberg arrived to learn about the new cosmology. The Lutherans at the University of Wittenberg would sort all his difficulties. Luther’s right hand man Philipp Melanchthon (1497–1560) was an educator who re-organized the whole educational system of Germany, founding and reforming several of its universities. He presided over the curriculum at the University of Wittenberg, and in 1536 helped Georg Rheticus obtain an appointment teaching astronomy and mathematics at the university. In 1539, Melanchthon arranged a two-year leave for Rheticus to study the technical capabilities of the printers and make contact with eminent astronomers. Rheticus took this opportunity to visit Copernicus in Frauenburg (now Frombork), Poland, and spent most of his two years with him. Rheticus brought Copernicus books in mathematics, and demonstrated the quality of printing for technical treatises that was available in German-speaking cities. Copernicus in turn entrusted Rheticus with a copy of his early Commentariolus (this particular copy eventually ended up with Tycho Brahe). Since Luther’s alleged comment dates from around 1539, it is possible that some very tentative ideas about heliocentrism had filtered back to Wittenberg via Rheticus. Though Copernicus was reluctant to publish his heliocentric theory, he allowed Rheticus to publish a short summary, Narratio Prima, to test the waters: First report to Johann Schöner on the Books of the Revolutions of the learned gentleman and distinguished mathematician, the Reverend Doctor Nicolaus Copernicus of Torun, Canon of Warmia, by a certain youth devoted to mathematics, which appeared in 1540. It was favourably received, and after two years, Rheticus finally convinced Copernicus to publish De Revolutionibus, and oversaw much of the printing of the book. On May 24, 1543 Copernicus was to hold a copy of the finished work on his deathbed. Luther would not himself die for another three years. His right hand man, Philipp Melancthon accepted the importance of teaching Copernican ideas at the University of Wittenberg, and his son-in-law Caspar Peucer (1525-1602) taught astronomy there, educating the students in Copernicus’ treatise. As a result, the University of Wittenberg became the main European centre where Copernicus’ work was studied. Erasmus Reinhold (1511–1553), a leading mathematician and astronomer at Wittenberg who became dean and rector of the University, became interested in heliocentrism on the basis of reports from Rheticus even before the publication of De Revolutionibus. 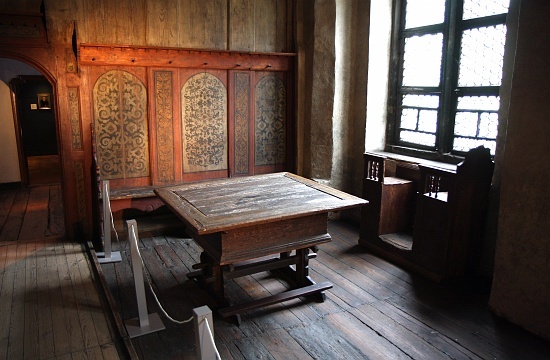 After publication, Melanchthon persuaded Albrecht Duke of Prussia to support Reinhold financially in the production of a new set of planetary tables from Copernicus’ work, called, after his patronage, the Prutenic Tables. Reinhold’s calculations paved the way for a more complete acceptance of heliocentrism when additional evidence became available through the work of Kepler, a devout Lutheran, and others. Nicholas Copernicus, the Hipparchus of our age, who is never praised enough…I have always cherished, esteemed, and honoured him not only as a teacher but also as a father. The educational reforms of Philip Melanchthon…ensured that Wittenberg and other Lutheran universities produced a number of highly competent and creative astronomers…Lutheran mathematicians agreed that Copernican models were superior in some respects to existing astronomical models…Both the geocentric majority and the tiny group of heliocentrists expected that a complete course of astronomical studies would include both Ptolemaic and Copernican models. Elizabethan authors frequently cited and even translated Lutheran works, suggesting that Lutheran influence played an important role in the English mathematical renaissance. Most readers turned to Lutheran sources for technical guidance, in part because Melanchthon’s followers had produced the leading works on Copernican astronomy. None of this squares with the oft-repeated claim that Luther or the Lutherans regarded Copernicus as a fool, or suppressed or persecuted heliocentrists. Quite the reverse. As usual, the lie seems to travel better than the truth. Today we cannot say that the Copernican theory is ‘right’ and the Ptolemaic theory ‘wrong’ in any meaningful physical sense.